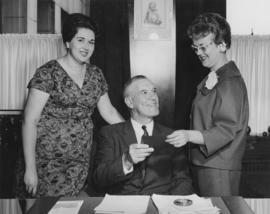 Photograph depicts mayor A. Thomas Alsbury signing a document with two unidentified women next to him. Photograph depicts Mayor Mike Harcourt signing a document with two unidentified women standing on either side of him. 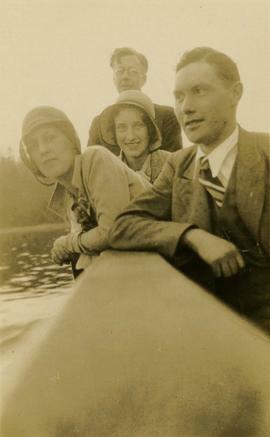 Photograph depicts (l-r) Premier Bill Bennett, an unidentified woman, and Izzy Fraeme.Written on the verso: "P. 6 - 2 x 4 54%. November 20/80. B.C. Premier Haro Park Centre." Photograph depicts unidentified people with Senator Jack Austin (third from left) and Sydney Zack (right). Also see Also see L.10049.